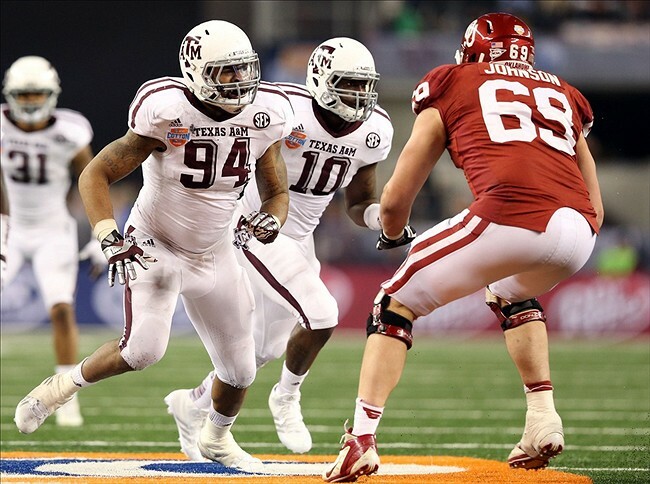 Lane Johnson shut down Texas A&M’s Damontre Moore in the Cotton Bowl. With the fourth overall pick in the 2013 NFL Draft, the Philadelphia Eagles selected Oklahoma offensive tackle Lane Johnson. The 6’6″, 303 pound tackle is a supremely athletic force along the offensive line. He’s relatively new to the position, but showed consistent improvement throughout his senior season and followed that up with a great week of practice at the Senior Bowl. He’s a fantastic fit for Chip Kelly’s up-tempo offense and can stretch the field on outside zone plays and even screen passes. Johnson fills a big need along the offensive line, figuring to step in at right tackle from day one. The Eagles now boast an excellent front five featuring Jason Peters, Evan Mathis, Jason Kelce, Todd Herremans, and Lane Johnson (from left to right). Johnson absolutely lit up the combine, running a historically fast 40-yard dash in 4.72 seconds. He’s still gaining experience, but he’s already a solid pass protector. He’s a smart player with a favorably nasty demeanor. He needs more coaching and should continue to add strength, but he figures to be a long-time starter on an offensive line that needed a good young player desperately.